Head restraints are provided for all seats. Pull the head restraint up. Push the head restraint down while pushing the lock release button. Pull the head restraint up while pressing the lock release button. 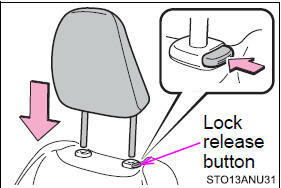 Pull the lock release knob and fold down the seatback until it reaches the position where the head restraints can be removed. Align the head restraint with installation holes and push it down to the lock position. 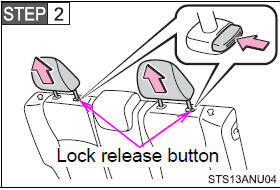 Press and hold the lock release button Lock when lowering the head restraint. 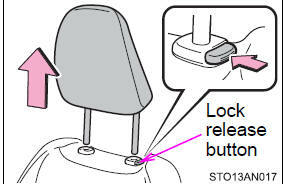 Pull the lock release knob and fold down the seatback until it reaches the position where the head restraints can be installed. Align the head restraint with installation holes and push it down to the lock position. 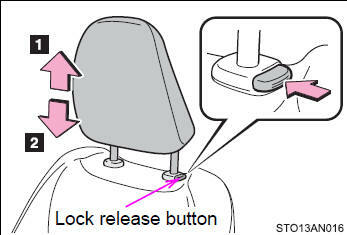 Press and hold the lock release button when lowering the head restraint. Make sure that the head restraints are adjusted so that the center of the head restraint is closest to the top of your ears. 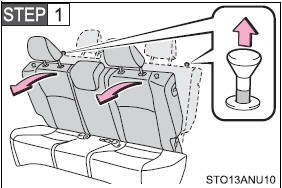 Always raise the head restraint one level from the stowed position when using. Observe the following precautions regarding the head restraints. Failure to do so may result in death or serious injury. 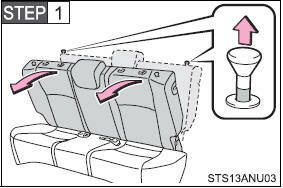 ●Use the head restraints designed for each respective seat. ●Adjust the head restraints to the correct position at all times. ●After adjusting the head restraints, push down on them and make sure they are locked in position. ●Do not drive with the head restraints removed.